9am, 5th August 1888: Kirkpatrick Fleming, a Dumfriesshire blacksmith, is handed a cast iron "hobby horse" to repair-using some gears from an old washing machine and pedals from an old exercise bike he had at home, he spends the morning spot welding and invents the worlds first pedal cycle. 1pm, 5th August 1888: His friend William Dunlop, a practicing Vet, drops by and seeing the new cycle suggests a smoother ride could be obtained by fitting his new inflatable rubber tyres. He quickly fits them and inflates them using a football pump. They admire their handiwork. “One day soon, every person will own a bicycle and walking will be a thing of the past. Shoe factories will go out of business, and walking stick makers will follow. Scotland will once again lead the world" They leave the cycle propped against the fence, and repair inside for a small libation. 1:20pm, 5th August 1888: Nugget McCafferty (local felon) walks past and, although he has never seen a bicycle and does not know what it is, steals it instinctively. Mr McCafferty has invented bicycle theft. He takes it home and props it against a lamppost outside his home. 1:30pm, 5th August 1888: Spud Williamson (local felon) sees the bicycle and, not knowing what it is, slashes the tyres to shreds using a Stanley knife. (Sir Edward Stanley had invented his knife for cutting linoleum in 1884, but it was largely unused as linoleum was not invented until 1898). Mr Williamson had invented tyre slashing. He also stole the pump, bent it, and threw it away. So Scotland exported bike theft and tyre slashing to the four corners of the globe. We should hold our heads high over this achievement. 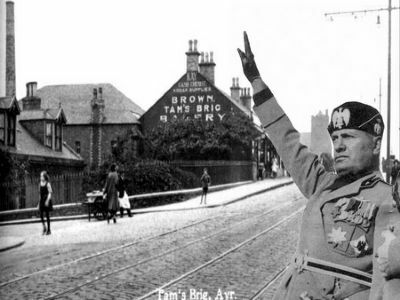 "Wee Benny" Mussolini hails a tram at Tam's Brig in Ayr circa 1938. 1880 - Two brothers, Paolo and Vito Mussolini, and their wives leave their native Italy. They settle in the town of Ayr on the west coast of Scotland, where they open a chip shop. 1883 - Maria Mussolini, wife of Paolo, gives birth to a son in the family home at New Road, Ayr, on 29th July. The child is named Benito. 1884 - Paolo and Maria return to Italy, taking their infant son with them. Vito and his wife remain in Ayr. 1905 - Benito, now aged 22, takes an extended holiday in Ayr. Whilst there, he helps out in his uncle Vito’s chip shop. Keen to see his family prosper, he persuades his uncle that the flavour and texture of his food would be improved by frying it in olive oil. 1906 - Having returned to Italy, Benito’s efforts to procure olive oil are frustrated by an embargo on exports. Unable to buy olive oil from a legitimate source, he makes a deal with Sicilian ‘fence’ Felo Falori to buy and ship 50 gallons of olive oil to Scotland. Unfortunately for Benito, his plan is leaked to Italian customs officials and he is arrested. 1907 - Convicted of trafficking stolen goods, Benito is sentenced to 18 months imprisonment in Rome’s notorious Monte Scopata jail. There, he shares a cell with Giuseppe Verdi, founder of the Italian Green Party, who is awaiting execution. Though unmoved by Verdi’s politics, Benito much admires his composure. 1910 - Benito marries the eldest daughter of Alessandro Zanussi, the Italian fridge magnate. He takes up employment as the company’s account manger for northern Italy. 1913 - A disgruntled former boyfriend of Benito’s wife has him arrested on trumped up charges of money laundering. Though innocent, Benito is once again jailed. He returns to Monte Scopata where he shares a cell with political dissident Cesare D’Amato, who has been imprisoned for the allegedly seditious content of his book ‘Giorni Dell’insalata’ (Salad Days). The two men become firm friends. 1918 - Released from jail, Benito discovers that his wife has taken up with another man. Frozen out by the Zanussi family, Benito throws himself into politics. 1919 - Cesare D’Amato is executed by the State Police at the instigation of the Vatican. Enraged, Benito writes inflammatory articles about the President of Italy and the Pope. He then flees the country, fearing for his own life. Whilst a fugitive, he shaves his head and becomes a Buddhist. He returns to Ayr, where he works for his uncle whilst honing his political theories. 1924 - Benito returns to Italy, where he founds the Fascist party. Appalled by the state of the Italian military, he co-writes a facetious new Italian national anthem, “Don’t shoot, we surrender.” His fame and fortune grow rapidly. 1934 - After a bloodless coup, Benito becomes dictator of Italy. He takes the title “Il Duce” in homage to his favourite film star, John Wayne - who also has his roots in Scotland. 1938 - Following the peaceful resolution of the Munich crisis, Benito returns to Ayr to visit his relatives. He travels incognito and without a bodyguard. As a joke on his last night in Ayr, he wears his dictator’s outfit to a fancy dress party. No one recognises him. He is photographed hailing a taxi outside his cousin’s house. 1945 - Benito and his mistress are executed by communist partisans. 1970 - Or were they? Rumours (which were neither substantiated nor refuted) surface that it was one of Benito’s doubles who was killed by the partisans and that the real Benito Mussolini returned to his native Ayrshire in 1948 where, under an assumed name, he opened and ran an ice-cream parlour in Girvan. Olive oil was eventually introduced to Scottish chip shops in 1966. Experts have calculated that the extra 60 years of lard-fried chip consumption caused substantially more deaths amongst Scottish men than resulted from the efforts of the entire Italian military during the whole of World War II.